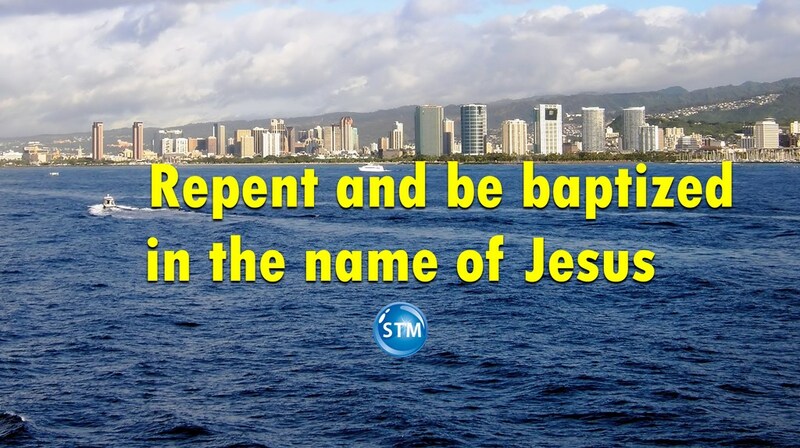 Repent and be baptized in the name of Jesus and know that God forgives you! This Bible study will show you why this is true. God forgives you—is it hard to believe that the God of creation will forgive you for doing things that do not please Him? There are conditions that you must understand and obey to receive forgiveness. This study will give Scriptures to help you understand what the conditions are. Jesus gives one condition; if you forgive others God will forgive you! Yes, God forgives you IF you forgive others. ‘To be forgiven, you must forgive’ is another way of saying it. Some do not believe there is a need for forgiveness since they have not done anything to require it. All people need forgiveness. Is it hard to believe and understand that God forgives you? Hopefully, by the end of this study, you see it more clearly. John gives another condition. 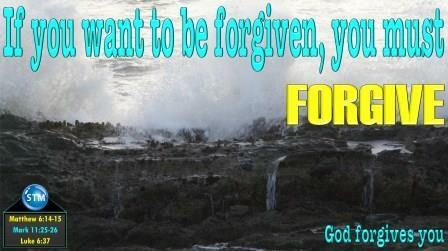 Yes, God forgives you IF you confess your sins. Forgiveness is the act of excusing, overlooking or clearing, pardoning, and releasing another from their crimes, flaws, and errors. As a religious word, forgiveness refers to God’s mercy towards the badness and evil of people. He is willing to forgive the sinful things that people do. NOTE: The Amplified (AMP) used forgiveness and release; eXeGeses Ready Research Bible (ERRB) used remission and forgiveness. Have you searched the Bible for answers to this question and found many scriptures that speak of God forgiving the sins of humankind? Hopefully, you understand the question. Without going too deep, if we read the Old Testament the high priests performed (blood) sacrifices for sins. There was a problem with this approach. In short, the problem was the high priests also had sinned. The solution: Jesus, the permanent high priest had NO sin, offered one sacrifice (himself) for all sin. Under the law [of Moses] almost all things are cleansed with blood; and without the shedding of blood there is no forgiveness [Hebrews 9:22]. Jesus paid the price and saved you from the penalty for sin. Now you must believe that God forgives you, the blood of Jesus made it possible. When is the forgiveness for sin applied? According to Peter, God forgives you when you repent and are water baptized in the name of Jesus! Do not get confused when you read what Peter says later regarding faith [Acts 10:43]. He reinforces the need for water baptism in verse 48. You must have faith that God forgives you when you repent and are baptized in water. Paul also confirms this in his letter to the faithful in Colossae. and in baptism you were also raised to life with him, through your faith in the omnipotence of God, who raised him from the dead. 13 And to you, who once were ‘dead,’ by reason of your sins and your uncircumcised nature — to you God gave life in giving life to Christ! He pardoned all our sins! 14 He canceled the bond which stood against us — the bond that consisted of ordinances — and which was directly hostile to us! And now why do you delay? arise, and be baptized, and wash away your sins, calling on his name. Paul (Saul) speaks of Ananias telling him to be (water) baptized. What a wonderful and loving God willing to become like His created human beings to save us. ‘So don’t lose the courage that you had in the past. Your courage will be rewarded richly. You must be patient. After you have done what God wants, you will get what he promised you. He says, “Very soon now, the one who is coming will come and will not be late. Hopefully you have a better understanding of why God forgives you, now forgive others and yourself! Blessings to you and your loved ones—♥ Tim. Matthew 6:5-15 [(14-15); compare Mark 11:25-26 and Luke 6:37-42 (37)]. Psalms 51:5-6 (5); Romans 5:12-21 (19); 1 Corinthians 15:20-28 (22). Romans 3:21-26 (23); Genesis 2:8-3:24; 1 John 1:5-10 (9-10). Acts 2:14-47 (38); Luke 24:44-47 (46-47). Hebrews 7:20-28 (27); Ephesians 1:3-14 (7, 13-14). Colossians 1:9-18 (13-14); Hebrews 9:16-28 (22 and 28). 1 John 4:7-11 (9); Acts 10:34-48 (43 and 48); Colossians 2:8-23 (11-15); Acts 22:1-21 [(16); reference Acts 9:10-19]. Hebrews 10:26-39 (35-39); Isaiah 43:22-28 (25); Hebrews 2:11-18 (17-18). 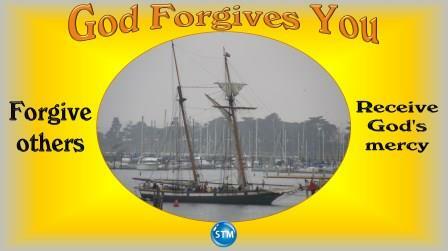 ♥ Question for “God forgives you”: Have you received forgiveness for your sins? (ERV) Taken from the HOLY BIBLE: EASY-TO-READ VERSION © 2001 by World Bible Translation Center, Inc. and used by permission. || (GW) Scripture is taken from GOD’S WORD®, © 1995 God’s Word to the Nations. Used by permission of Baker Publishing Group. || (ISV) Scripture taken from the Holy Bible: International Standard Version®. Copyright © 1996-forever by The ISV Foundation. ALL RIGHTS RESERVED INTERNATIONALLY. Used by permission. || Quotations designated (NET) are from the NET Bible® copyright ©1996-2006 by Biblical Studies Press, L.L.C. http://netbible.com All rights reserved. Thief Part 2; What Can the Devil Steal From a Child of God? Changed Life; Have You Absolutely Changed For the Good? 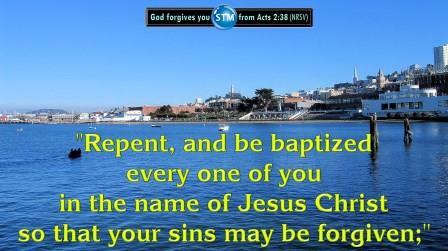 #Repent and be #baptized in the name of #Jesus and God will #forgive your #sins. be immersed [baptized] in the name of Jesus Christ so that your sins will be forgiven [by God] and then you will receive the gift of the Holy Spirit. Thank you beautiful lady, I appreciate your support! Thank you, this was truly a Blessing and I will share this Good word!